American National Standard NPTF Hex Style. 1/8" to 2" and larger are provided with "Milled" wrench flats. 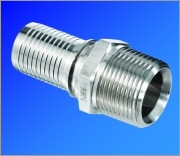 Pipe Thread fittings are Type 316L Stainless Steel standard. Monel®, Brass, Zinc plated carbon steel, Hastelloy, Titanium, Alloy ZO cb, Polypropylene, PVDF and other materials are available by special order. Monel® is a registered trademark of the International Nickel Company. No items in your quote request. ©2010-2019 Sani-Tech West, Inc. All rights reserved.